Freelance facilitator and writer. Interested in: sustainable living; sustainable production; enviromental and ecopsychology; self development; adult learning; yoga; poetry; social and environmental justice; having fun; living mindfully; reflection; nature; and space. Poetry ID will be reading a selection of our poems at The Sunrunner, Bancroft, Hitchin on Monday 16 April 2012. Free admission. There is also an opportunity for anyone attending to read 1 or 2 of their own poems. Time 8pm. See our Events page for other upcoming dates. Poetry ID at Letchworth Library…. 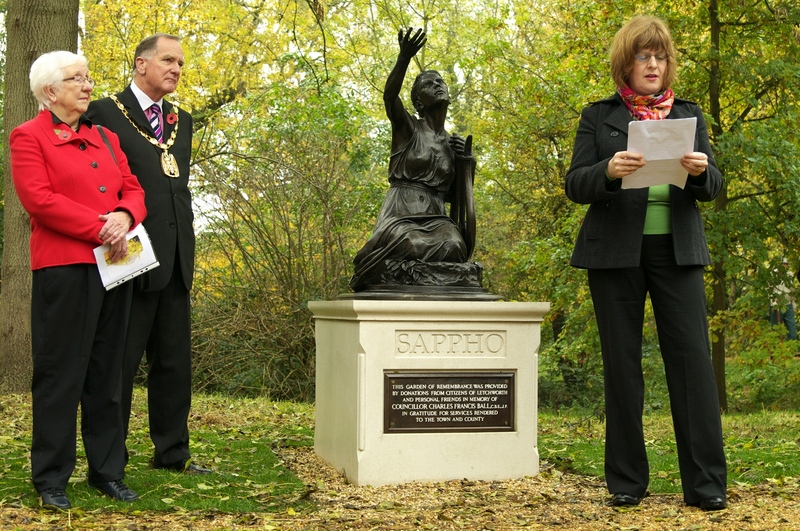 Poetry ID were invited to read at the unveiling of the new Sappho statue in Letchworth Garden City. Poetry ID are hosting a poetry reading and open mic night as part of Letchworth and Wallington’s George Orwell Festival. Further details on the events page. We hope to see you there! Poetry ID are holding an Open Mic Night at The Highlander in Hitchin on Thursday 21 July. The evening will start at 8pm. All welcome, whether simply to listen or to read a poem. We look forward to seeing you there.